I want to buy a Berkshire product/size/colour that I don't see on your website? How do I order it? We can supply any Berkshire product, but due to the huge range, we simply cannot stock everything. If you do want a certain product/size/variety which we don't have in stock, we can almost always order it for you. We also have a large variety of colours pictured below. To place an order for any item that is not shown on the website, please email us at sales@thehosieryboutique.com.au. 1. Credit card (VISA and Mastercard) processed by Paypal. 2. Bank deposit - direct transfer/deposit to our ANZ Bank Account. 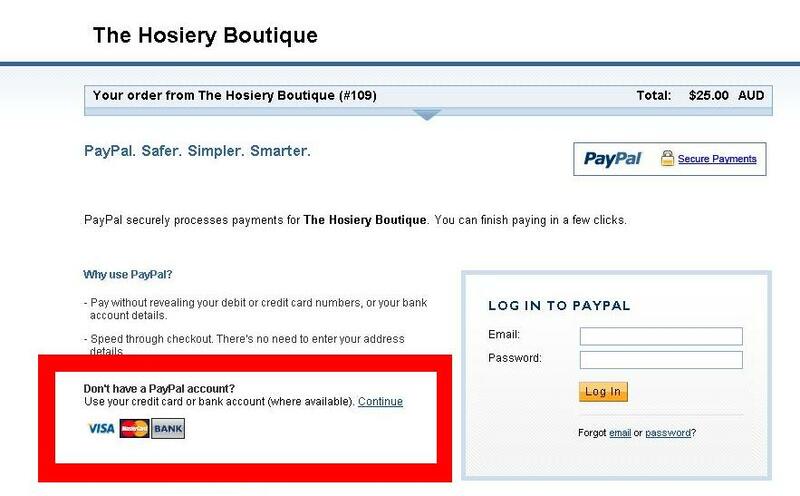 You don't need to setup a Paypal account to use VISA/MC. Please follow the prompts on the Paypal payment page. See the area in Red in the image below, if you just want to use Credit Card without setting up a Paypal account. Bank Details will be supplied on the Checkout Page. Please ensure you choose Bank Deposit option , not Paypal on checkout. Can I pay for the order upon delivery/drop off? All items must be prepaid by payment methods above, we don't accept COD. All Stock items are shipped within 48 hours upon receiving payment, unless otherwise notified. Please see the "Gift Certificate" link at the top of the home page for further instructions.